A dispute between longshoremen and shipping companies has created a backlog that’s leaving cargo ships sitting offshore waiting to be unloaded, and export goods languishing on the docks. What’s the fight about, and what’s the wider impact -- especially on California’s delicate citrus industry? Then, in our weekly web roundup, a look at the scary-slash-promising possibility of “The Internet of Things,” a future point when all our appliances and even our bodies are connected online. In our film segment, a look at the Oscar nominees in animation, foreign film, and other less talked-about categories. And finally, legendary DJ Art Laboe is off L.A.’s airwaves for the first time in 60 years...at least for now. There’s a crisis at the nation’s West Coast ports. 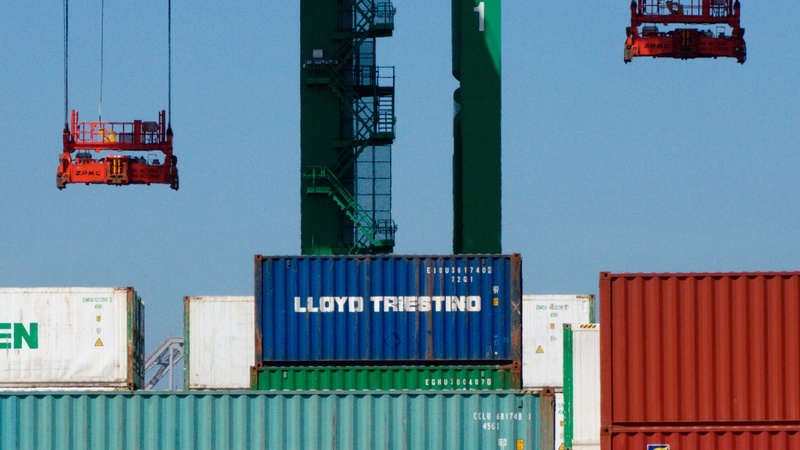 An ongoing dispute between longshoremen and shipping companies has led to a suspension of unloading cargo ships.